Eating more honey in winter can make you smile - more than your taste buds smile. For centuries the healing properties of honey have been utilised by manufacturers of cold and flu medications. However more than just a sweet throat soother, honey contains compounds thought to function as antioxidants, including chrysin, pinobanksin, vitamin C, catalase, and pinocembrin. But it can be added to other things other than your tea and porridge in the morning. The ancient Romans used it to cure skin disorders, the Egyptians used it to preserve the Pharaohs (including Tutankhamun) whilst Cleopatra took milk and honey baths to maintain a youthful complexion. Honey is used in beauty products like hair treatments, soap, perfume, face scrubs and body balms for much the same reason Cleopatra added it to her bath - the minerals and vitamins in it help to soothe and calm the skin. 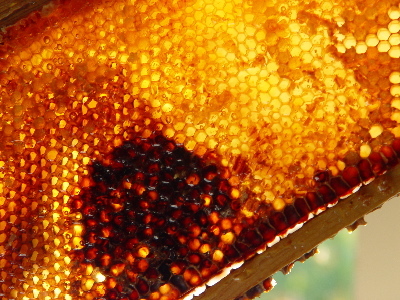 Honey is naturally produced by our buzzing friends the bees. Working bees who ingest the nectar of flower pollen and change the structure of it by reducing the water content and adding a waxy protective coating, only live for about six weeks. Given the integral part they play in the process of creating our honey, as well as their involvement in helping fruit trees to reproduce, it's a sad fact that the UK bee population is currently under massive threat. Bees are prone to a number of diseases so pesticides and antibiotics need to be used to keep the colonies alive. The best thing we can do to keep the golden nectar flowing and our bees happy is to support organic honey and plant high pollen producing flowers in our gardens.